Our Impressa® Health Advocates are here to help you better understand your body and learn how Poise® Impressa® Bladder Supports can help you say goodbye to bladder leaks. 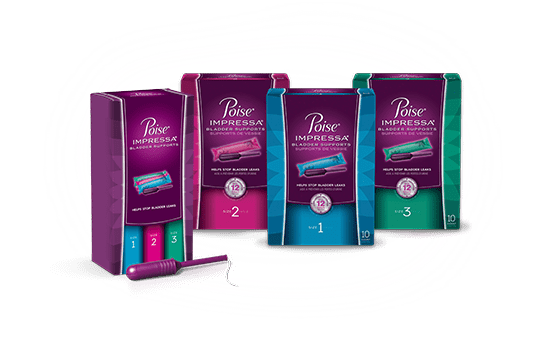 Q: Poise® Impressa® vs. Tampon | What's the Difference? Q: Is Impressa® A Bladder Control Tampon? Q: What is a bladder support? SEE WHY 9 of 10 women would recommend Poise® Impressa® to friends and family. From causes of light bladder leakage (LBL) to tips and products to help manage leaks, our LBL Starter Guide is here to help. Available Monday-Friday from 8 a.m. to 6 p.m. Central Time. Have a product question or a concern? Connect with us here or give us a call at 1-877-947-6473 so we can assist you. †Always is a registered trademark of P&G. All names, logos and trademarks are the property of Kimberly-Clark Worldwide, Inc. or its affiliates. © KCWW. All Rights Reserved.